Find me a woman (or man) who does not want to be calmer or slimmer… or both. It is, quite honestly, all that most of us really want, especially in February when the last few weeks have been about nothing but failed diet attempts, mixed with the stress of feeling penniless after Christmas. Charlotte Watts, a nutritional therapist and experienced yoga teacher, and Anna Magee, an award-winning health journalist, have brought out a book (I mean, bible) to take us to a better place. The De-Stress Diet promises a world where we are not as frantic and therefore do not crave the fist-full of After Eight mints I seem to consume as I rush to finish my deadlines or the childrens’ homework. Much like my grandma sat and listened to Radio 4 with her eyes shut after lunch each day, we desperately need to put our day on hold to take 10 deep breaths. By doing this, we are relaxing our nervous system and edging away from a constant state of alert. Increasing our protein intake at breakfast is crucial. Eggs, cold meats, smoked salmon, avocado. These are all non-sugar alternatives for our most important meal of the day. Lovin’. Yes, you heard me. We need to spend more time with our loved ones as this will make us feel calmer and happier. It sounds obvious but is often the hardest to achieve. Walking in the sunlight. I know Charlotte is also a yoga-queen but she is right, both walking and natural sunlight will make us feel less stressed and therefore prevent us from reaching for that sugar hit. Charlotte’s advice all makes perfect sense. 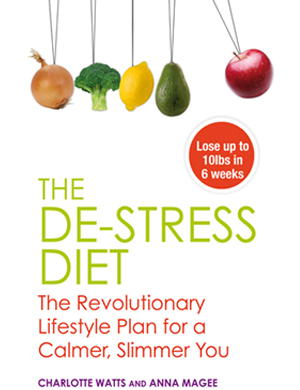 The book is easy to read and the lifestyle information surprisingly digestible (excuse the pun). Using her advice, I am determined to avoid some of today’s unnecessary stresses and to effortlessly lose those few pounds as I go.